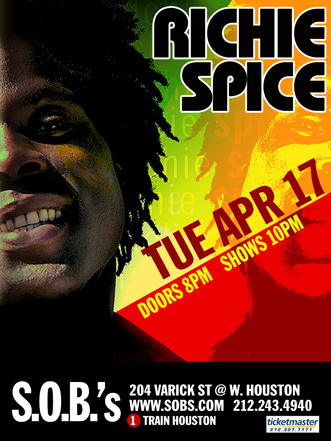 On April 17th, S.O.B.’s brings you the hottest Tuesday night reggae party in NYC with superstar Richie Spice. Although he got his start in 1994, most reggae fans became acquainted with Richie Spice in 2004 when his single “Earth A Run Red” began its ascent on the charts, first in Jamaica, then internationally, ultimately emerging as one of the year’s biggest hits. A subsequent video (directed by Ras Kassa) brought even greater visibility to Spice’s career and it wasn’t long before he became one of the most sought after artists for stage shows across Jamaica. Spice’s new album, In The Streets to Africa, was released by VP Records in February 2007. Spice has reached a new musical plateau on In The Streets, with an appealing brand of roots reggae that is characterized by smooth impassioned vocals that lovingly caress the rhythm, as on his romantic boom shot “Brown Skin”, or just as convincingly, deliver the militant energy of a righteous rebel warrior on the Bobby Konders produced “Youth So Cold”. Guided by the principles of his Rastafarian way of life, Spice’s lyrics rail against injustices and the plight of the oppressed, implore assistance for the youth and extend maximum respect to the ladies. “My responsibility is to use the talent that God gave me as an instrument to uplift people who are facing the struggle worldwide and let them feel happy in themselves,” Spice explains. On April 17th, Spice’s musical talent and integrity and S.O.B.’s legendary history of presenting the best in reggae music will combine for a truly special night of rhythms and tunes.